The Borrowers are Arriety Clock (Aisling Loftus) Pod (Christopher Eccleston) and Homily (Sharon Horgon) they are a family that lives under the floorboards of James Millman’s house. James is boy is having a rough time. His mother has recently died and they’re in the middle of a recession, which has forced James and his father to move in with James’ Grandmother (Victoria Wood). 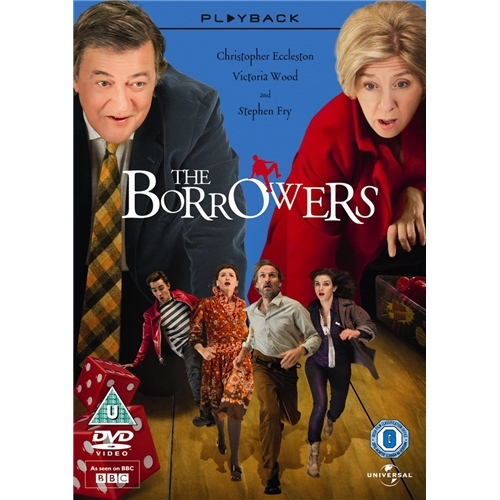 The grandmother has contacted a Professor (Stephen Fry) and alerted him to the Borrowers presence, the family, are then forced to go on the run with a fellow Borrower and tour guide, Spiller (Robert Sheehan). The great thing about this version of the Borrowers is that like Doctor Who, this is very much a family show. Adults will laugh at jokes that will go over the heads of kids, whilst the kids will laugh at the characters sliding down into the sewers. The casting is a masterstroke and it was great to see Stephen Fry in an acting role. He is a joy in this and for the most part, steals the show. Christopher Eccleston and Sharon Horgan also put in excellent performances. Eccleston is great as the over protective father. The only let down here is Robert Sheehan, now it isn’t’ his performance, that’s fine. As always he gives 110% but the character of Spiller is just a child friendly version of Misfits’ Nathan, I had hoped to see him in a more challenging role this soon after him leaving Misfits. The one to look out for is Aisling Loftus her Wide-eyed naivety/ enthusiastic take on Arrierty is believable and sweet. I predict big things for her in the future.